it's Yolanda here, from Scraping Time. I am so happy to show you the card I have made with the sweet new stamps set "Brush bunny". When I first saw it in Instagram I thought it was amazing but when I reveived it at home I hadn´t words to describe it! It´s a beauty!!!!!!! I thought it was a good idea to make a "Happy Easter" card since I am sure I will use the love sentiments later a lot! These sentiments are amazing. When you stamp them on the card, you can´t believe it is a stamp since they seem to be printed!! Stunning! I did some paper piecing since it is one of my favourite techniques! 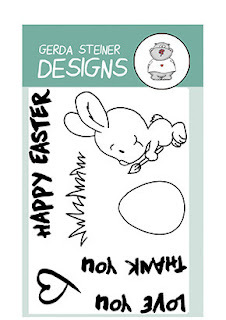 I also did some masking to stamp the three eggs and the grass behind the cute bunny! I wanted to make a sweet card and I decided to combine the scene with decorated papers. I chose this light pink one for the panel and also for the cloud where I stamped the sentiment. I coloured the bunny with spectrum noir markers. I put some Wink of Stella Clear on the brush, ear and some parts of the grass to give it some light shine. Sorry, I didn´t catch it in the picture! I hope you enjoy the card and see you soon with more projects.